ASUS has launched a new series of phones ZenFone 3. The device has a premium design and is a feature-packed smartphone. This is part of the new iteration of the iconic series which includes Zenfone 3, ZenFone 3 Deluxe and ZenFone 3 Ultra. All ZenFone 3 series models have unique designs and features that include cameras which allow users to take better photos, as well as the latest processors that make them powerful entertainment devices. There is a radical change in design of ZenFone 3 from the previous ZenFone 2. 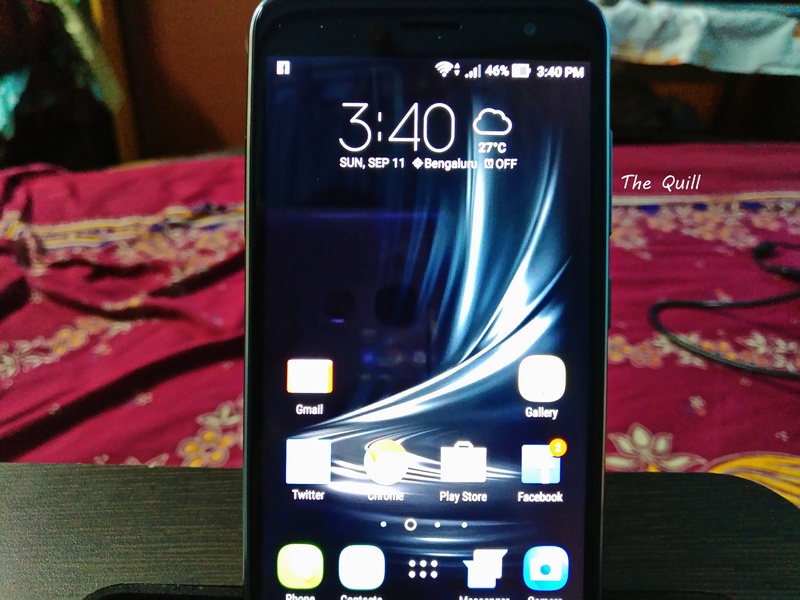 We spent some time with the Zenfone 3 and here is our review. With 5.5 inch Full HD Super IPS + LCD, the ZenFone 3 delivers a very good visual experience. In a slim and compact body, ZenFone 3 provides 77.3% screen-to-body ratio with a narrow bezel and gives a maximized viewing area. The front and rear of the phone are covered with scratch-resistant Corning Gorilla Glass 3 that is intelligently contoured to make the edge of the phone completely smooth. Let us first look at the specifications of ZenFone 3. At first let us see the design of ZenFone 3. The beautifully sleek and flat monolithic block with attractively rounded corners of ZenFone 3 make it not much larger than the display it houses.It has a very slim side profile of only 7.7mm. With premium glass and aluminum construction and the overall effect is a beautiful, sophisticated appearance. ZenFone 3 is protected by with protective sheets of tough Corning Gorilla Glass 3 in the front and rear. 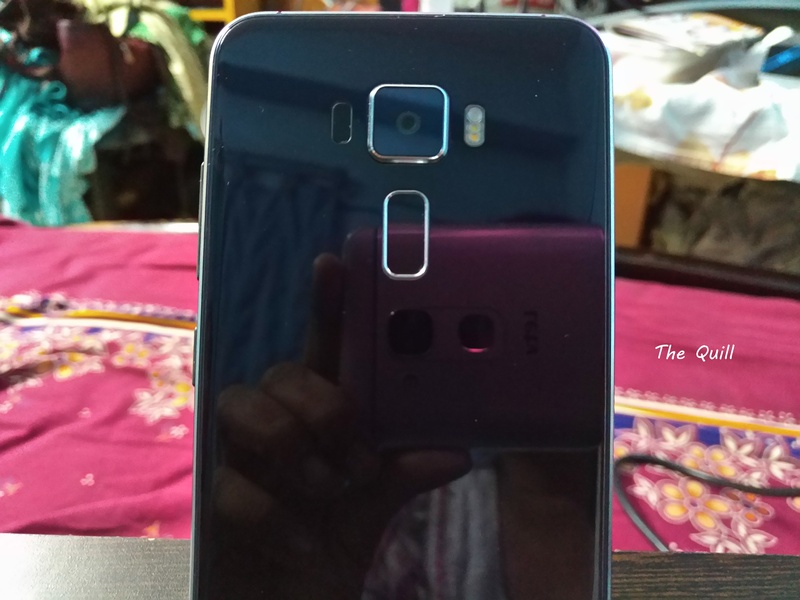 There is an ASUS hairline spun metal concentric circle pattern under the rear glass panel. that is reminds one of a Japanese Zen garden and the series to which the device belongs. When the viewer’s angle changes with the light this is prominently visible. There are 2.5D contoured edges on both the front and rear glass panels. With diamond cut metallic edges the contouring fuses well into the panel. The ZenFone 3 runs on the latest version of Android 6.0 (Marshmallow), and features the latest ZenUI 3.0 interface. 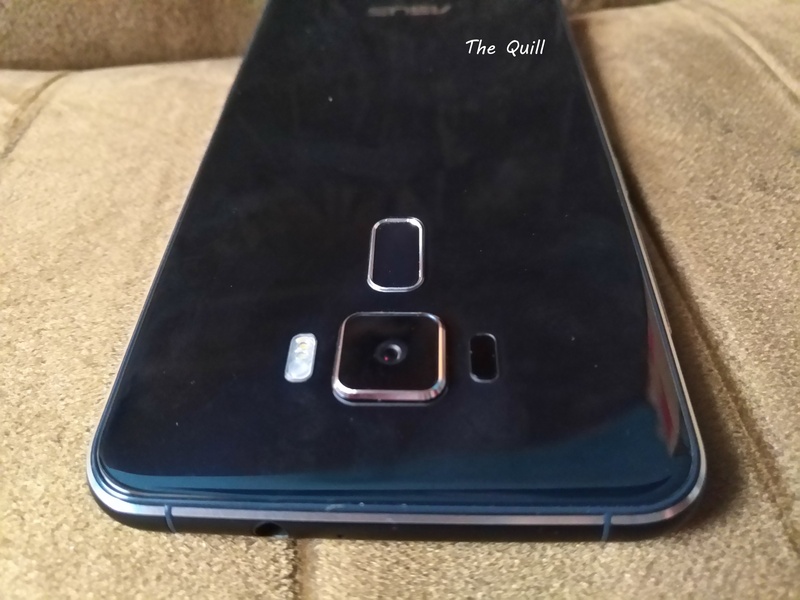 The fingerprint sensor is positioned in the rear panel near the top and the fingerprint sensor unlocks the phone in just 0.22 second. Up to five fingerprints can be registered and it can detect the fingerprint regardless of the direction of the fingers placed on it. This is popularly known as 3D touch in tech parlance. ZenFone 3 has a rounded aluminum alloy frame and a finely sandblasted surface. 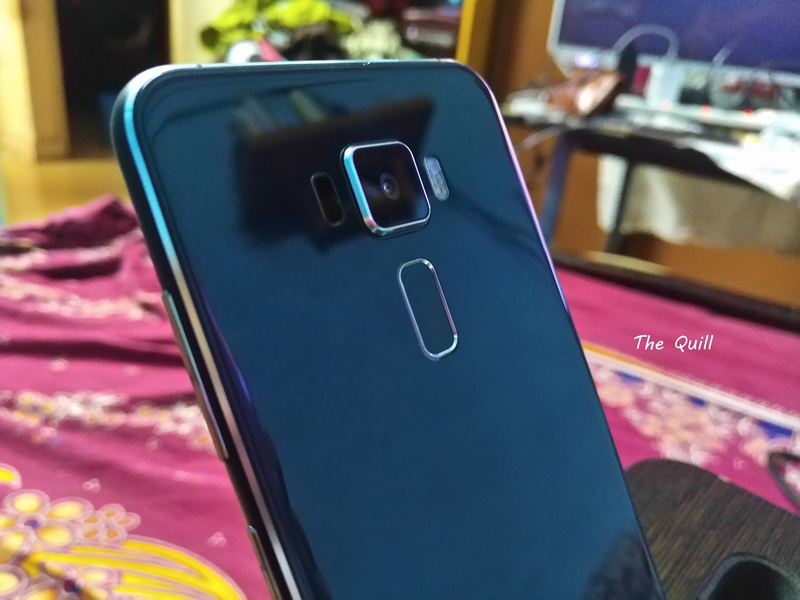 Together the rounded edges and the contoured edges of the glass gives the ZenFone 3 a very good look. ZenFone 3 comes in four colors – Sapphire Black, Aqua Blue Shimmers, Moonlight White and Shimmer Gold. We got the black version of the phone. It looks very sleek and premium. The downside of the glass is that it is a fingerprint magnet. Wiping regularly is a must with this one. Coming to the display of ZenFone 3, with 5.2 inch Full HD (1920 x 1080) Super IPS+ panel makes the phone ideal for playing Blu-Ray movies with full high-resolution. The display is also very bright with a brightness of 600 nits. As it has IPS panel, it has a wide viewing angle of 178 degrees which makes it clearly readable from any direction. The display also has a very slim bezel of that is only 2.1 mm wide which makes the screen-to-body ratio to a high 77.3%. This gives a maximized screen area with minimum phone body and bulk. On the camera front, ZenFone 3 has ASUS PixelMaster 3.0 and the rear camera uses Sony’s latest 16-megapixel Exmor RS IMX298 sensor. We tried taking lot of photos with the phone both indoors and outdoors. The photos came out very well. The photos were good even in low light. The ZenFone 3’s color correction sensor first detected the lighting in the scene and automatically adjusted the colors in the photo to look natural and accurate. With triple technology auto-focus system, the ZenFone 3 focuses in 0.03 seconds in any objects. The EIS video output of the ZenFone 3 has a maximum resolution of 4K (3840 × 2160). Here are some pictures that were taken with the ZenFone 3. The audio performance of ZenFone 3 was also good with SonicMaster technology, featuring a new NXP Smart Amp and Hi-Res Audio support and new powerful 5-Magnet, NXP Amp powered speakers. The speakers also has compact smart amplifier from mobile device audio experts NXP. ZenFone 3 also has Hi-Res Audio(HRA) certified which gives ultra-clear audio with superior sound staging and fidelity to the original recording, and overall quality that is 4x CD quality. All music tracks were clear and crisp. No distortion or buzzing. It is the first smartphone powered by the new Qualcomm Snapdragon 625 octa-core processor which results in significantly improved battery life. It is also accompanied with Adreno 506 graphics engine which makes the graphic display very realistic for gamers. It also has an integrated X9 LTE modem, and 802.11ac MU-MIMO Wi-Fi connectivity, PC-grade graphics and 3GB RAM that together deliver outstanding mobile performance with improved efficiency and battery life. On a single charge the battery lasted for roughly 12 hours on above average use with a combination of 4G and Wi-Fi where we also played videos and games which is very impressive at this price. It also comes with fast charging option which gives 2 hours of talk time with just a 5 minutes of charging. Are there downside? Yes, the device is slippery without a back cover and the usual ASUS gift of a lot of apps that keep updating but you never use them. Low light photos are a tad bit noisy. But these issues pale in comparison to the many plus points the device has. It is direct competition with the Le Max2 and The Smartron t.phone at this price range. Many people were saying that the price is a tad bit high, but we feel that given the package and what the device brings to the table, the price is fairly justified. With the price of Rs. 21,999 and lots of good features like efficient Qualcomm Snapdragon 625 14nm octa-core processor, 16MP ASUS PixelMaster 3.0 camera, full HD display and the brightest 600nits screen, the only 4K video recording capability, and the highest screen to body ratio of 77.3% ZenFone 3 is a good value for money device. In short – it is a Nearly Flawless Workhorse. Charges quickly, runs well and runs long.